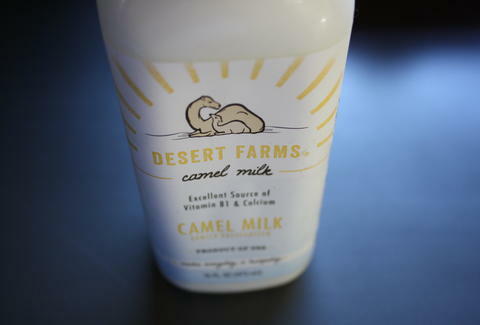 When you find out that Whole Foods is carrying camel milk, you immediately do two things: 1) you sing that line from Aladdin about the caravan camels roaming, and 2) you agree to taste-test it. 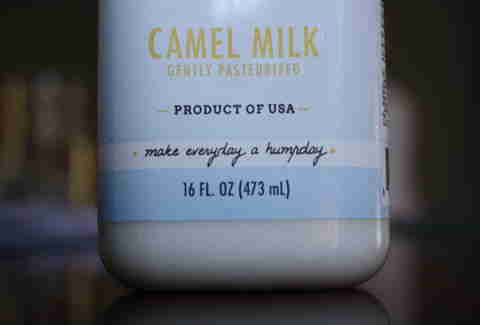 According to the bottle, it's an opportunity to "make everyday a humpday" which seems like a pretty good value proposition considering how much everyone loves... Wednesdays. The milk itself is apparently an "excellent source of Vitamin B1 & calcium" (like… regular milk? ), it's a "Product of USA" (F'yeah America! Also: we have camels????? ), and it has "50% less fat and saturated fat than USDA whole milk" so it's basically half-fat milk. 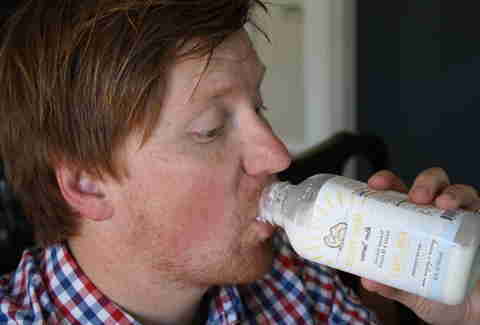 "Camel milk is nature's most wholesome dairy drink. Prized for centuries by Nomads and Bedouins for its nutritional and medicinal ales, we've now captured their secret and locked it tight in this bottle." The bottle isn't that hard to open, so I'm not sure about this whole "locked it tight" deal, but the Nomads and Bedouins thing is pretty awesome, especially after I Google Image search "Bedouins" and find out they look like in-disguise Indiana Jones in Raiders of the Lost Ark. Honestly, like whole milk (which is terrible), but a little chunkier (also terrible) and with a weird sweetness at the end that makes it linger in your mouth (not sure if this is terrible). Let's just say if you gave me a bottle of this and a bottle of regular whole milk, I'd probably go with this. But if you gave me a bottle of this and a bottle of Pucker Sour Apple Schnapps, I'd probably go with the Pucker Sour Apple Schnapps. According to Rachel Koppes, who does PR for... camels?... in 2006, the United Nations hailed the nutritional value of camel milk, predicting higher consumption and widespread adoption once it became easier for consumers to get their hands on it. Eight years later two things are pretty clear: 1) the UN is super silly, and 2) this stuff is just kinda eh.